I'll be honest here and say that summer is my least favorite season (I can't stand the heat!). When I lived in California, summers were bearable since there was no humidity in California. However, here in NYC there is humidity and it makes hot weather all the more worse. I feel that you have to work twice as hard to keep your skin in tip-top condition when you're in humid weather since you sweat a lot more. Your face just feels sticky, hot, and just all around gross. Do you feel the same way? 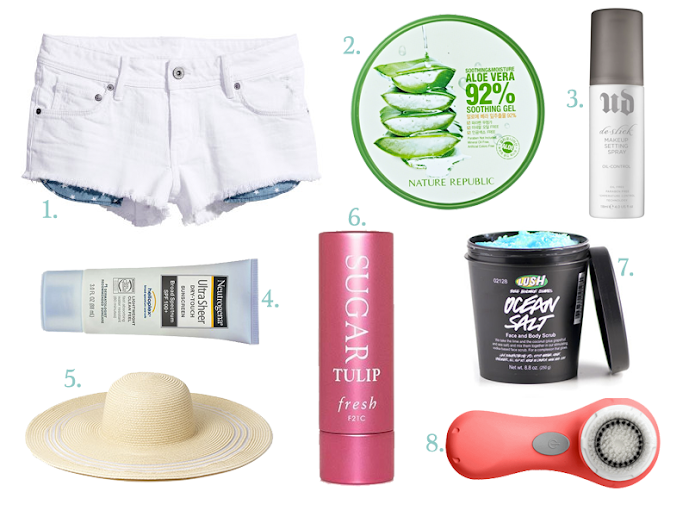 If so, click through the jump to see some of my summer staples that get me through the hot & humid months. 1. H&M White Cut-Off Shorts: Pretty self-explanatory why you should have a pair of white denim shorts for the summer. I think this pair of H&M is particularly cute because the pockets are a contrasting blue with a star print! White denim cut-offs and a white t-shirt is pretty much a go-to outfit for me on scorcher days. 2. Nature Republic Aloe Vera Gel: This stuff has so many uses, but I use it as a cooling body and face gel. Just put it in the fridge for 15-20 minutes, and you've got an instant cooling gel. It's also perfect for sunburn and it can even prevent peeling if you pack on the gel while your skin is still red and irritated. You don't have to get Nature Republic's brand specifically. Any aloe vera gel brand will give you the same benefits and uses. 3. Urban Decay Deslick Makeup Setting Spray: All us oily skinned gals (like me), use this stuff all year round, but humidity does not discriminate and everyone should use Deslick during the summer! It keeps your makeup from sliding off your face and it keeps oil at bay. Setting your makeup with this spray can gain you about 2-4 hours extra wearing time on your makeup. 4. Neutrogena Ultra Sheer SPF 100+: Is 100+ SPF overkilling it? Probably. But if you're not planning to take any pictures, this sunblock will surely protect you from the sun whether you're commuting to work, or if you'll be outdoors for the bulk of the day. 5. Forever 21 Wide Brimmed Hat: Another self-explanatory item like the denim cut-offs. A wide-brimmed hat to keep your face protected from the sun is a must if you're doing an outdoor activity and will be in the sun for a couple hours. 6. Fresh Sugar Tulip Tinted Lip Treatment: Wearing a full blown lipstick or lipgloss in hot weather can be uncomfortable. Instead, opt for a tinted lip balm so you can protect your lips from the sun, condition, and add a pop of color. Fresh's lip treatments are amazing and smell like lemonade! Just be sure not to leave it in your beach bag because it will melt! 7. Lush Ocean Salt Face & Body Scrub: I don't know about you, but sometimes I feel like my body needs a really good scrub during the summer. This stuff is a concoction of lime, vodka, sea-salt, and coconut. It's definitely not for the extremely sensitive skinned gals, but if your skin can handle the exfoliation, you'll feel refreshed and clean after a sticky summer day if you use this scrub. 8. Clarisonic Mia2: It's the same concept as above, except the Clarisonic deeply exfoliates your face. Depending on how sensitive your skin is, you can use the Clarisonic twice a day everyday. But for more sensitive skinned gals, keep it to once or twice a week. I usually like to do an extra day of exfoliation when I feel like my face has suffered a particularly gross summer day. Stay cool wherever you are! !